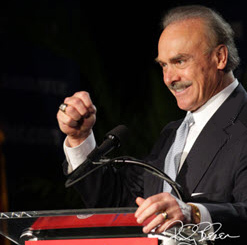 As national spokesman for the National Veteran-Owned Business Association (NaVOBA), Rocky Bleier advocates on behalf of the nation’s 3 million entrepreneurs with the same optimism, passion, and steadfast determination that were his trademarks as a four-time Super Bowl winning running back with the Pittsburgh Steelers. In his role, Rocky writes and speaks to various constituencies of the value that entrepreneurs bring. He also heads most of NaVOBA’s grassroots membership drives. Since retiring in 1980, Rocky has run his own successful small business – Rocky Bleier Inc. www.rockybleierinc.com – as a motivational speaker and instructor. Drawing on his personal experiences of overcoming adversity and reaching for goals, Rocky’s “Be the Best You Can Be” message is ideal for the development of corporate executives, enhancing sales and marketing, or offering inspiration to young professionals or practical advice for student athletes. He is also president of a service-disabled veteran-owned construction company called RBVetCo, LLC. Rocky has a BS degree in Business Management from the University of Notre Dame in 1968.